Algae can quickly become a problem in backyard ponds, pools and water features. There are a wide variety of products available for algae control, and sifting through all the information to choose the right one can be difficult. Copper sulfate and aluminum sulfate are both used in the treatment and control of algae, but they are two very different chemicals. 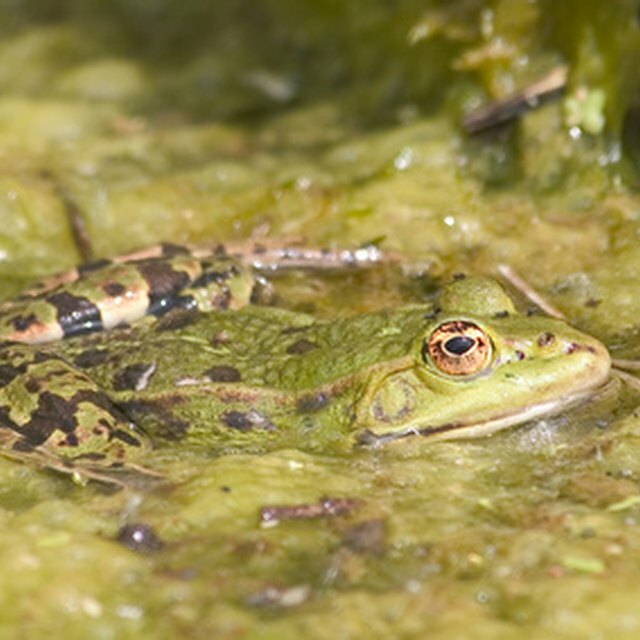 Controlling algae will help keep pond water healthy. Aluminum sulfate acts to control algae by first controlling the amount of phosphorus available in the water. When there is too much of this nutrient in the water --- where it usually accumulates from fertilizer runoff --- the resulting algae growth can cover the body of water. When aluminum sulfate is activated by the water, it forms a chemical called aluminum hydroxide. This chemical then reacts with the phosphorus, binding the compounds together and removing the phosphorus from the water. Once the algae loses this food source, it will begin to die. Since phosphorus also fuels the reproduction of algae, there will no longer be a large-scale growth present. Copper sulfate kills algae directly, but, depending on the alkalinity or acidity of the water, its effectiveness can be greatly decreased. When mixed with hard water, copper sulfate forms a compound known as copper carbonate and is rendered ineffective. For it to be effective, the total alkalinity has to be between 50 and 250 parts per million (ppm). Copper sulfate is available in either a powder or crystal form, and must be dissolved before it is applied to the pond. Its affordability has long made it a popular chemical control for algae, but the application needs to be exact to keep it from doing more harm than good. Aluminum sulfate and the compound it turns into once immersed in water, aluminum hydroxide, are not toxic to plant life, fish or any other wildlife that might be present in the pond when the chemical is applied correctly. It is usually applied with another compound, sodium aluminate, that keeps the composition of the water at a consistent level to prevent any fluctuation in water chemistry. Copper sulfate, however, can be highly toxic to fish. Application of this chemical can result in fish kills throughout the entire body of water, especially when the total alkalinity of the water is too low. When the copper sulfate becomes copper carbonate, this chemical does not break down any further and instead collects on the bottom of the pond. If this builds up too much, it can kill the plant life growing in the pond and create more problems within the ecosystem. Copper sulfate should not be used in water with low alkalinity, water that has already developed severe algal blooms or water that supports fish and other life that is highly susceptible to chemical changes in the water. It should also not be used in water where wildlife relies on microorganisms and invertebrates as a food source, as these can quickly die, and the bottom of the food chain will collapse. Aluminum sulfate is a much safer compound, although it is more expensive than copper sulfate. Aluminum sulfate will also help eliminate odors and make the water clearer, in addition to removing the algae. How Is Boric Acid Used in the Garden? How Much Flaxseed Should Be Added to Chicken Feed? What Causes Scum in Ponds? What Is a Thatched Roof Made of? How Often Should Well Water Be Tested?